I know, of course, that’s not what you meant when you added your name to the front. But let’s ponder this. Because personalizing our Bibles, naming them as our own, illustrates a tendency we do have. 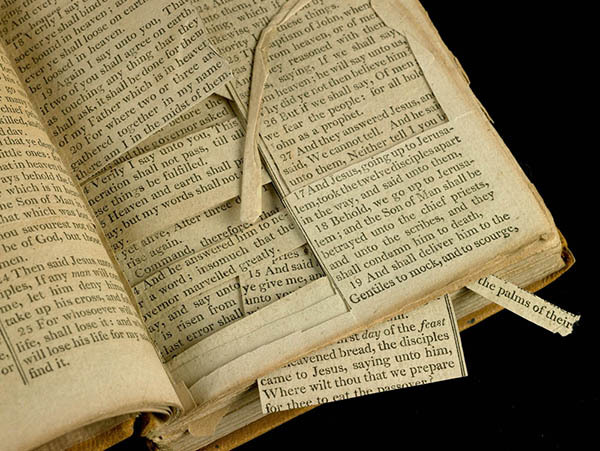 We treat the Scriptures as if they’re our literary property to toy with as we please. We do this in countless ways, but I’d like us to focus on one of them. It’s what I call the Hallmarkization of the Bible. Let me give you an illustration. Years ago, when I was the newest member of a seminary faculty, I attended a conference designed to help me and others be better educators. During one of the devotional periods, a priest guided us through Psalm 139. He prayed each verse slowly and we repeated it. A few seconds for silent reflection followed. That was all well and good. I actually enjoyed the slow, meditative pace. We eased our way through the first 18 verses of the psalm. Then it happened. He played biblical leapfrog. He skipped right over four verses. We went from praying, “I awake and I am still with you…” to “Search me, O God, and know my heart.” We jumped from verse 18 all the way to verse 23. And it was no accident. What did the priest skip? These rather jagged words: “Oh that you would slay the wicked, O God! O men of bloodshed, depart from me! They speak against you with malicious intent; your enemies take your name in vain! Do I not hate those who hate you, O Lord? And do I not loathe those who rise up against you? I hate them with complete hatred; I count them my enemies,” (Ps 139:19-22). The psalm suited the fancy of the priest—up to a point. But when he came face to face with rocky words, uncomfortable truths, he wimped out. He pretended as if he wielded authorial power to edit the contents. Rather than letting God speak to us fully and freely, even harshly, he rewrote the script. What is our unspoken prayer? Dear God, give us only the words we want to hear. Nothing more, nothing less. This is the Hallmarkization of the Bible. 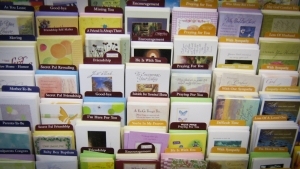 When we buy someone a card, we select one but not others. We buy the one that says what we want it to say. The card puts our thoughts into pretty words. So we do with the Bible. We find the parts that echo our sentiments, that mirror our feelings. And the other parts, we skip, we edit out, we ignore. After all, it’s our own personal Bible. This is the real tragedy in the Hallmarkization of the Bible: the things we need to hear the most are usually the things we want to hear the least. For instance, we want to hear that we are good people with good hearts that just need a little grace to help us along the way. Then David comes along and rains on our parade: “There is no one who does good, not even one,” (Ps 53:3). Jeremiah shows up and ruins our positive self-image: “The heart is deceitful above all things; and desperately sick,” (Jer 17:9). And Paul, worst of all, won’t let us be merely ill or spiritually weak apart from Christ. No, he says, “You were dead in your trespasses and sins,” (Eph 2:1). Nobody wants to hear that. Just like nobody wants to struggle with psalm verses about hating enemies or the myriad of other parts of the Bible that rub us the wrong way. But the Bible is God’s book, not ours. The Lord calls us to read it, meditate upon it, struggle with it, pray it, teach it. But we are never called to cherry-pick those parts that are pleasing to our spiritual palate and trash the rest. If we’re going to put anyone’s name on the front of the Bible, let’s put this one: Jesus Christ. Not only is He the author; He’s the content as well. And He’s the only one by whom and through whom we grasp the goal of the Scriptures. For according to His own testimony, all the Scriptures are—in one way or another—about Him (cf. Luke 24:27). The sweet and sour, the smooth and the jagged, the curses and consolations: they are finally all about Him. He doesn’t tell us what we want to hear, but what we need to hear. He says it won’t be our goodness that gets us into heaven, or our badness that keeps us out. It will be He, and He alone, who gets us in. He says it won’t be our good hearts that placate the Father’s wrath, or our bad hearts that turn the Father away. It is Christ, and Christ alone, who takes away the wrath of God by taking that wrath into Himself. He says it won’t be our spiritual convalescence that finally gets us healthy enough to walk the straight and narrow. It is Jesus, and Jesus alone, who puts His life into us, heaves us onto His shoulders, and carries us through the straight and narrow way that leads home to the Father. Every part of the Bible is about Him because every part of the Bible is written to bring Him to us. In Him we may not find answers to all the questions we have, but He will give us the most important answer: Himself. We will still struggle to understand many parts of the Scriptures, including those warlike verses the priest skipped over, but Christ will give us the peace that passes all understanding. Your own personal Bible doesn’t exist. Nor does your own personal Jesus, for that matter. But in that Bible, of which Jesus is the author and content, you have what the Father desires to give you: truth, peace, forgiveness, salvation, and life in His Son. *I am indebted to A. J. Swoboda, in A Glorious Dark: Finding Hope in the Tension Between Belief and Experience, pp. 189-190, for his critical reflections on this practice.